Hylozoic Soil is one in a series of works by the artist that explores the newest techniques and materials, interactive geotextiles and reflexive and responsive membranes, networks of actuated objects, and canvases composed of primitive interactive systems. The works use sensors and proximity detectors, muscle wires, actuators, and distributed networks of microprocessors. All reflect Beesleys knowledge of architectural textiles honed at the Integrated Centre for Visualization, Design and Manufacturing (ICVDM) at the University of Waterloo. In less technical terms, the materials and components in the room produce a reactive environment able to detect the presence of visitors. Proximity sensors trigger tiny structures assembled into a tangled network of clouds that tremble as visitors pass. Beesley explores these new responsive environments made possible through state-of-the-art materials used by architects in experimental research and increasingly in architectural projects. His recent work has focused on a current trend known as responsive architecture, which explores how natural and artificial systems interact. However, the term responsive also invokes the concept of responsibility  of conscious action. Responsibility implies sensitivity, explains the artist. 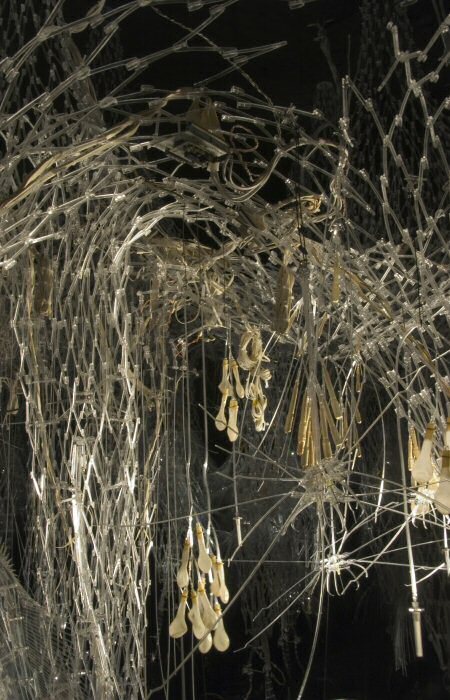 (2) Art, technology and design, when applied to this responsive architecture, allow Beesley and his colleagues to exceed the binary oppositions of our traditional ways of thinking: oppositions such as subject/object, self/other, form/function, organic/inorganic, static/dynamic. One of the means used to overcome these dichotomies lies in the temporality of biological systems, and one of the models used in the design and realisation of such environments is biomimicry, the digital simulation of functions, behaviours, actions and reactions of living organisms. 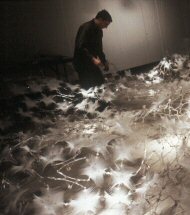 However, as an artist, Beesley says that a source for this collection of sculptural works can be found in nineteenth and twentieth-century spiritualist texts that dwell on uncanny mixtures of anxiety and hope. (3) In recent writings of the artist, the search for a holistic relationship with environments built from these new materials can also be found. Beesley has written that the boundary between environment and organism is indeed blurred (4) through the use of these responsive materials in the creation of reflexive membranes. This blurring of the boundaries between visitors and the intriguing vegetation that reacts to their arrival aims to create a pacified space where the centre and periphery, the organism and its environment can no longer be distinguished. At the heart of this reflection resides a will to reconcile natural processes and the artificial world. 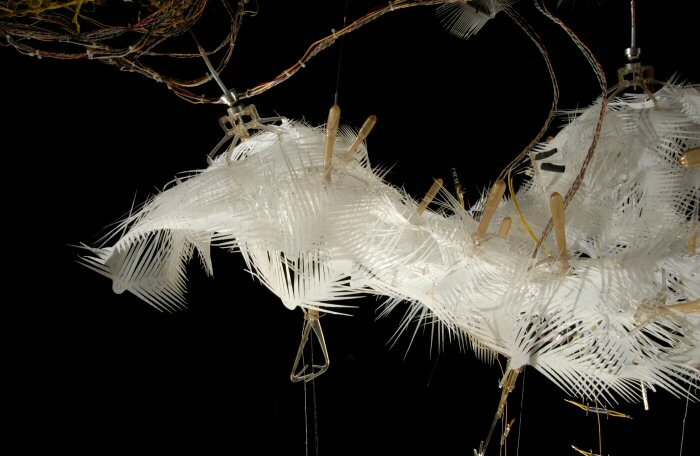 (2) Philip Beesley, Sachiko Hirosue; Jim Ruxton, Toward Responsive Architectures in Responsive Architectures: Subtle Technologies 06, edited by Philip Beesley, Sachiko Hirosue and Jim Ruxton (Toronto: Riverside Architectural Press, 2006): p. 3. 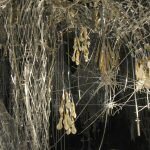 (4) Philip Beesley, Sachiko Hirosue; Jim Ruxton, Toward Responsive Architectures, op. cit., p. 4. 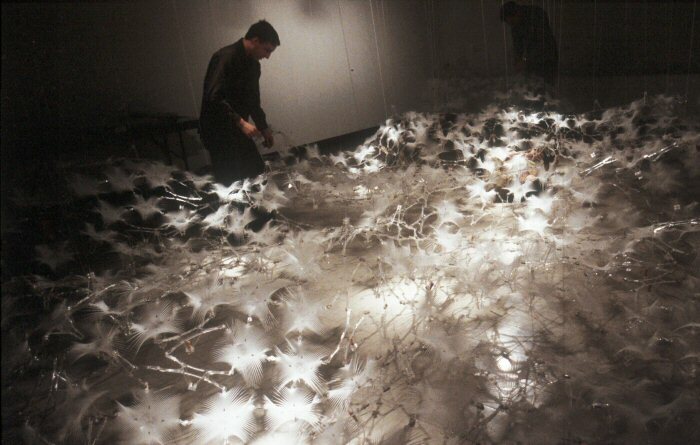 A renowned architect and stage designer, Philip Beesley produces installations using leading-edge technology. He is also a professor at the University of Waterloo School of Architecture and co-director of the Universitys Integrated Centre for Visualization, Design and Manufacturing (ICVDM). After studying Fine Art at Queens University, Beesley completed a degree in Architecture at the University of Toronto. It is in Toronto that he founded his own firm and works today, designing residential and public buildings and conducting design projects for exhibitions and the performing arts. He has won a number of awards for his work, including the Ontario Lieutenant Governors Medal for Architecture, the Prix de Rome for Architecture, and, in 2005, the Canadian Architect Award of Excellence for the graphic design of the French River Visitor Centre. 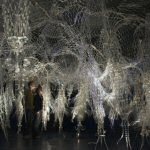 In addition to his architectural work, Beesley has created numerous installations that draw on his research into architectural textiles and more specifically interlinked mesh structures.